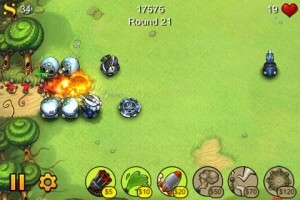 Fieldrunners, in my opinion, is the best “Tower Defense” style game in the App Store. It is one of the only ones that allows for an arbitrary path for your enemy to follow. That’s right, unlike many other TD games, in Fieldrunners, you layout the path (by virtue of setting up your towers in a way that causes the enemy to go around them). You layout your map however you like, providing that you leave a path for the enemy to get from one side of the map to the other. However, you can divert them back and forth as many times as you like to make sure they get exposure to all of your weapons and defenses. In the last update, Fieldrunners adds yet another map (bringing the total now to three) and a couple of new weapons to use against your enemies. There are also three play modes for each map, once you reach level 100 then these are unlocked which allows you to play the same map endlessly which is just fun to see how long you can last. There are various videos on YouTube on how to get past level 160, which appears to be a tough one. In all if you are a fan of the tower defense games and you haven’t yet considered Fieldrunners then this is your app this week. Fieldrunners is $4.99 in the iTunes App Store.